So, full disclosure, I had originally written this post a few months ago with the intention of it going up on another site. Unfortunately, due to editorial problems it was left on the shelf. After breaking my ties with the site, I then decided it would be such a waste to keep this post sitting there, so here it is. This post has been slightly changed to roll with the changes since it was originally written. Also, since it was intended for Amerikan eyes the spelling of some words is very clearly wrong. I apologize to all the fans of the letter U who read the site and can only ask that you move past your prejudices and enjoy the post. Thank you. Beer…SCHNAPS? Kind of weird to think about I know, but it is out there and it’s surprising to say the least. Be forewarned, this isn’t the syrupy sweet schnapps that comes in distinct chemicaly flavors like could-be-mint and I-think-that’s-what-peach-tastes-like and alternates as the combination to Elaine’s Vault (ask your parents or think back a bit, come on I’m not that old). This is the traditional, clean, crisp, and strong-as-hell liquor with a unique process brought over from Austria. 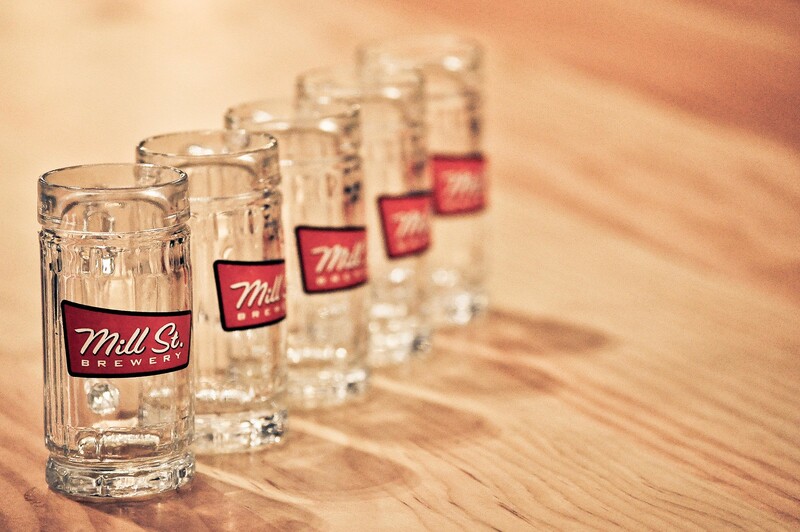 To be honest I first heard about this style when Mill Street Brewery, based in the touristy Distillery District here in Toronto, announced the opening of a Beer Hall with an in-house micro distillery way back in April. 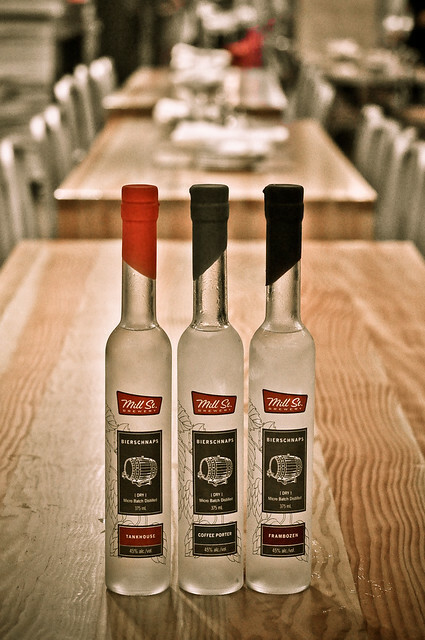 The plan was to exclusively make their own brand of Bierschnaps with three of their flagship beers, Tankhouse Ale, Coffee Porter and Frambozen as a base. So how is it done? To put it simply, they brew the three beers to a higher alcohol level than they usually are (around 7% abv) and run it through a double distillation process. Before the second distillation the “low-wine” is steeped for a while in a selected ingredient for that extra flavorful push. In the case of the Tankhouse, it’s cascade hops and in the case of the Frambozen, it’s whole raspberries. The resulting clear liquid, roughly 45% abv, is bottled, sealed with individually colored sealing wax and placed in fridges both for the pub and the store to be enjoyed as an Apéritif between courses or…just for the hell of it, I imagine, in little tiny beer stein shot glasses imported from Austria. I should admit that the first time I tried this was at a friend’s house for dinner and my initial reaction….wasn’t too favorable. While I am familiar with hard liquor, my palate has been trained to pick up subtle hints of things and any kind of boozy beverage that is the taste equivalent of a hammer slamming in to my tongue is going to give my senses a bit of a jolt. But the second time I tried it was at the Beer Hall under the supervision and direction of Mill Street owner Joel Manning and Head Distiller Kaitlin Vandenbosch and after an explanation of how to pick up the flavors, it turned out better. As far as taste goes, I really think that context is important before trying. Bierschnaps, according to Manning and Vandenbosch, isn’t a drink to swirl about in the mouth and savor. It’s meant to be downed in one shot quickly. The flavor notes work after it’s knocked back, when the remaining liquid warms and moves up your throat. The Frambozen, for instance, lets out a not-too-subtle hint of fresh raspberries and the tankhouse has the unmistakable notes of hops as well as the malts that went in to the original beer. As an aside, if you ever get the chance to try a shot of Bierschnaps with a pint of the beer it was based on, I strongly reccomend it. Having a shot of the Tankhouse with a pint of Tankhouse as a chaser really opened up the flavors for me and helped me figure out some of the things I was tasting in the schnaps. Bottles of the Frambozen, Coffee Porter and Tankhouse Bierschnaps are available only at the Mill Street retail store at their brewery for about $35 and can be a fun novelty gift for a loved one based in lands not our own. As of writing, Mill Street was in the planning stages of upcoming seasonal releases of Bierschnaps and readying the release of a new bottle to the family of three called Hopfenschnaps, which is a hoppier and more spiced version based with the Tankhouse ale and is a kicker at 55% ABV. Bottles of that are currently available at the retail store for $39.50. If that’s too expensive for your blood, they do serve individual shots at their brewpub.